Playing in an online casino is easy and straight forward, and gambling online gives you access to a huge amount of different games, from blackjack, roulette and baccarat to slots, scratch cards, video poker, pick ‘n click, and more. Instead of being forced to settle for the games offered in your local casino you can sample games from a long row of different game developers and find the ones that suit you best. We each have our own tastes and preferences when it comes to gambling. A majority of the games available in an online casino is usually slots, and several new slots are released by game developers each month. Examples of popular slot games that can be played online are Starburst, Elements – The Awakening, When the Night Falls, The Slothfather, Scarface, Gonzo’s Quest, Lara Croft Tomb Raider, Blood Suckers and Frankenstein. Games with progressive jackpots are also very popular, e.g. Mega Moolah, Mega Fortune, Arabian Nights, Hall of Gods, Beach Life, The Incredible Hulk, King Cashalot, Fantastic 4, Cluedo, Cleopatra, and Monopoly. A vast majority of all available slot games have three or five spinning reels, but there are some titles that separates themselves from the norm. Gonzo’s Quest is for instance devoid of animated spinning reels. Instead, stone blocks come tumbling down over the screen when you play, is if you were in an ancient collapsing temple in the jungle. Each stone block has a symbol carved into it. Every time you form a winning symbol combination, those blocks explode, leaving room for new blocks to come tumbling down. 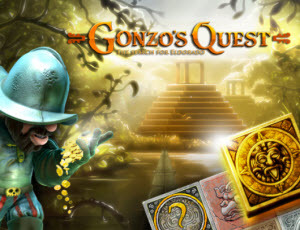 Due to this function, it is possible to win over and over again without having to make a new bet when playing Gonzo’s Quest.